So I'm going to be picking up our long neglected campaign of Mechs Vs Minions, but will be around from 1800ish if anyone fancies something quick beforehand. Anybody want to play Cuba? 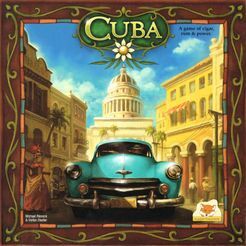 Euro game about trading cigars and rum in pre-revolution Cuba. Plays up to 5. Hi Rik - I'd like to join the Cuba game please. Dale wrote: Hi Rik - I'd like to join the Cuba game please. No problem ill be there at 7 to set up. DaveB wrote: So I'm going to be picking up our long neglected campaign of Mechs Vs Minions, but will be around from 1800ish if anyone fancies something quick beforehand.